Brett Higginson, with Leo Koppens, get ready for a day’s work in the Tamahere Reserve. 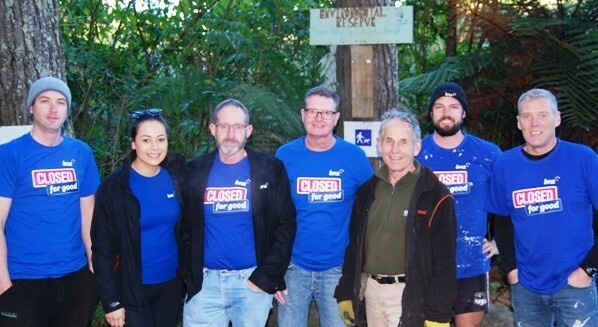 Each year the BNZ closes its banks and most of its support offices for one day to enable its staff to get out into New Zealand communities to lend a hand. The six Hamilton staff worked from 8.30am to 3.30pm weeding, cutting willows and resurfacing tracks with sand. “They were a huge help,” said Koppens, chair of the Tamahere Mangaone Restoration Trust. “They were well out of their comfort zone but they worked hard and have given us a huge jump on our work programme.